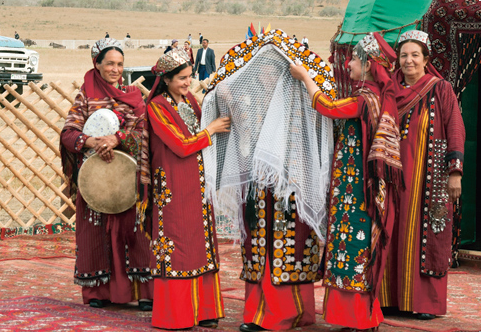 Turkmenistan, like any Eastern country, is famous for its hospitality and friendliness. Guests are a real holiday for every family. They set the table with the most delicious and beautiful dishes. Bread and salt are sacred for Turkmens and it’s the main detail for any dish. Every meal is accompanied by green tea – Turkmens drink it in large quantities in the cold and even in heat. Turkmens highly value honor. It carries not only by man, but also by his family and the whole race. Nobility is another feature of people. It’s a great shame for a man if he doesn’t keep his word. Spirit of kinship is strongly developed among the locals. Family is on the first place not only for women but also for men. 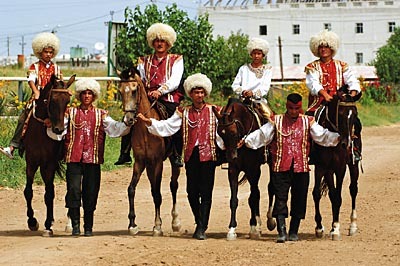 Turkmens try to maintain good relations with neighbors. Sincerity is another quality that is highly appreciated by Turkmens. Folk wisdom says "Speak the truth, even if it turns against you". Locals don’t like people who are constantly gossiping, are cowardice and ingratitude. From early childhood, child is taught to respect adults. The habit persists even in adulthood. Turkmens never argue with adults and don’t complain. Customs requires reverence of parents and their wishes must be fulfilled. Father is the head of the family. He protects women, children, and has the right to evaluate the actions of their children. Respect is shown not only to father but also to mother. Disrespect to parents is condemned by others.